It’s that time of the year again, when we announce the new additions to the SAP Mentors community. These new SAP Mentors are nominated by members of our SAP Community and beyond (for example by SAP partners, SAP teams, user groups, and other SAP Mentors), and represent some of the most influential and passionate people in our ecosystem. Some are veterans, while others may be new to the SAP Community. Many thanks to the SAP Mentors Advisory Board (and Malin Liden who took my place while I was away during the selection process), and the Mentors Program team (Kati Fischer, Maria Farrales and Shilpa Krishnaswamy) for their valuable time spent reviewing all nominations and applications, shortlisting and selecting the new Mentors! Please join me in congratulating and welcoming our newest SAP Mentors. He’s back! Maybe with a few more grey hair – SAP Mentor alum, and long time SDN/SCN rockstar. Feeling nostalgic? Check out this blog post. University lecturer and ABAP Code Retreat co-founder. Learn more about his thrill-seeking ways in this July 2016 Member of the Month interview. Partner of SAP and thought leader in digital & disruptive technologies, his knowledge of SAP and cloud landscape will surely make a huge impact to the Mentors Program. Prolific blogger on development topics from ABAP and Java, to UI Webclient. Read about how and why he’s able to keep learning from this January 2017 Member of the Month interview. Community Moderator and Top Contributor for Gateway and Fiori, his passion for building community and sharing his expertise will continue to benefit our community. Outspoken SAP customer and active community member. Learn more about how he transition from accountant to programmer in this January 2016 Member of the Month interview. Don’t let his youthful appearance take away from the depth of expertise he has in cloud and mobile technologies. Our community benefits from his innovative blogs and sessions at events. Seasoned SAP expert currently leading localization efforts of Ariba in Japan. She is building relationships between SAP customers and partners, while demonstrating practical use cases of business applications. We’re accepting nominations and applications to the SAP Mentors Program all year round. As our database of candidates grow each year, we’re fortunate to have such a large pool of experts to draw from and get to know. 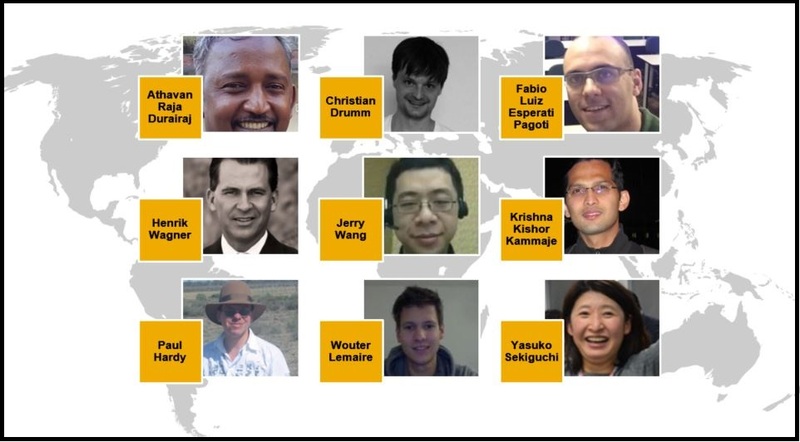 Our challenge for each selection round is to find not only the most passionate people, but also those in the SAP ecosystem where we lack representation. If you’ve submitted a nomination (or application), we thank you, and just want to tell you not to be discouraged if this candidate was not selected in this intake round. Please stay tuned for our next intake in August. Your past support and efforts are much appreciated, and we hope you will continue to engage with the SAP community as you join a distinguished group of the most respected SAP Mentors we’ve had the pleasure of working with. Great big hugs! New cultures and talent added to our SAP Community! So excited to see two additional Members of the Month join the group. Cheers Christian and Paul. Indeed, I am sorry for that oversight. Cheers to Jerry Wang too – awesome! Congratulations to the new Mentors. To those moving onwards and upwards to the Mentor Alumni ranks thank you for your valuable contributions – and remember “Once a SAP Mentor – always a SAP Mentor”. Cheers to our new mentor! Thanks for your contributions to the Community. Congratulations to new mentors and many thanks to mentors who decided to be alumni, we learned from them too much. Also big thanks to Jason, Kati and selection board, they did, may be most tough work during selection. Congratulations to the new Mentors! Also congrats to the Advisory Board and Program team for making those hard (I guess!?) choices in less than a Month! Very tough choices indeed! There were multiple rounds of shortlisting and voting. I missed the selection rounds this time, because of vacation, so thanks again to the Board and program team for coming up with the great result. Selection gets more difficult each time because our pool of excellent candidate gets bigger each yet (this is a good problem to have). Btw, 9 seems to be a trend – purely coincidental I can assure you (unless there’s some mathematical reason for 7 Advisory Board members’ votes to yield 9 candidates after 2 voting rounds?). Congratulations guys! Hope to see some of you at Sapphire or TechEd. Congratulations to all our new mentors and I second Jason, with a big thank you to all our valued alumni! Congratulations to new SAP Mentors. Welcome to the pack. All the very best. @Krishna K.: Welcome. Hope to see you soon. Congratulations to the new SAP Mentors, well done to all of them! Congrats to all. I am looking forward to seeing you in the upcoming SAP events! I am very glad to be now part of this awesome team. I must thank some people for the recognition and others for teaching me what I know. Flávio Furlan – The one and only, who created the brazilian website ABAP101.com, who enabled me to share my first thoughts to the SAP world. Flávio not being a SAP Mentor already is the most unrighteousness thing ever! He shares his knowledge in many channels for more than a decade and he was the teacher of almost all ABAP developers who are experts today. For me, the best Mentor of all ever. (Btw, I have choosen number 899 as it makes 1000 when summed with 101). Former Member – Who taught me how to do proper SELECT statements making me walk by the office carrying small rocks – I still own one of those small rocks as a great reminder of such a friendship. Julio Oliveira and Heber Filgueiras – awesome people with great knowledge. I cannot put here half of the things I have learned with both. DJ Adams – The most inspiring SAP Mentor for me – I really follow his steps and I thank him for teaching me UI5 and many others things through blog posts and tweets. There are qualified people, there are ninjas, there are experts, there are gurus, there are myths and there is Thomas Jung. Thank you for also inspiring me as a teacher. Rui Nogueira – Who I have met in person in Brazil at SAP Forum. The best teacher of OpenSAP.com together with Thomas Jung. Daniel Navarro – The only one who first accepted the challenge of creating new SAP courses in Brazil. UI5, HANA, Gateway, Fiori are just a few courses who we invested together first and are now being copied by many others who didn’t have the guts and the vision when ABAP courses were still solding out. Marlo Simon – The first SAP Mentor who I met in person and the one who invited me to the SAP Inside Track first when I didn’t even know such thing even existed. I wish I could work with him any day. Tobias Hoffman – Who nominated me – this already was an honour even bigger than becoming a SAP Mentor. Other brazilian Mentors: specially Bruno Lucattelli and Marssel Vilaça – who joined me and Daniel on the challenge of teaching the best of SAP to the best people and who I always enjoy meeting at SAP Inside Tracks. Amanda Protasio – The woman I love and the one who convinced me to accept the offer of becoming a mentor. Trust me, I would not accept the offer if there weren’t for her. I really want to make the nomination worthwhile. I really hope to meet other SAP Mentors anytime soon. Congratulations for all other mentors! Hope to meet you in person soon. Congrats! This is quite a list of all-stars, Fabio! Congratulations! Wow !!! Inspiring !! & Of course – Congratulations !! I wonder why my comment here done in April 3rd is awaiting moderation while some others were published afterwards. My deepest apologies for the inconvenience. We have certain checks in place to help us prevent spam, one of which is the number of links included in the comment. Because you had many links to people’s profiles (noting that this is an issue that would be resolved with @mentioning), it got stuck in pending status. I’ve released your comment above, and again, apologies for the delay. As you can see, @mentioning does not work. Anyway.. thanks for approving the comment. Yes, sorry, it was a misplaced comment of support for the work our team is doing to bring back @mentioning functionality (an oft requested item that would have prevented this issue). Thank you Fábio for your mention! You deserve! Congratulations my friend! We the best of the best, what can we have? Congratulations to all new SAP mentors. Congratulates to all new mentors! Congratulation to all the new mentors. Congratulations to everyone, Just wanted to understand more on this Program. I work on SAP BODS and SAP BW and intend to write blogs on the same. Can you please let me know if there are specific categories in which these mentors are awarded like Microsoft MVP program ? Great question Shubham! Mentors usually specialize and are recognized Influencers in a specific topic such as a SAP solution, industry, or line of business. However, Mentors don’t necessarily need to be SAP experts either. We’ve found that expertise in related areas such as Design Thinking adds so much to the diversity, and therefore health, of the community. You are free to blog where you please. And the Community would be pleased to see your blogs here too. Perhaps you can consider posting a few blogs here to first to see what feedback you get? Good luck, and please let me know how it goes!